Drone technology allows for safe mapping of terrains and property that autonomously pilot with the push of a button. Land surveyors can now use drones that produce high-quality surveying results that equal or surpass traditional methods, and is a cost-efficient way to complete more projects in less time. Whether you are a land developer, agribusiness experts, construction engineer, or a full-service A&E firm, utilizing a drone surveying service allows the surveyors to be safer, spend less time on each site trip, and save or re-budget money. In addition to, it can develop a range of resources surveys that can evaluate the land of any project area for agricultural purposes, roadways or congested city landscapes. 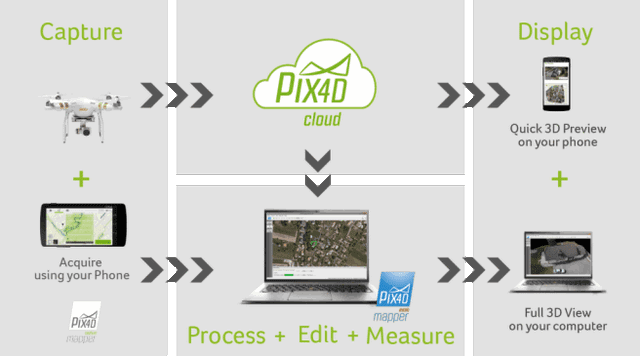 One of drone mapping and photogrammetry software is Pix4D that you can go about processing the images captured to get the needed outputs. Here we explain how to use Pix4D for mapping. So let's start with Pix4D cloud. This is one of the outer towers of Pix4D which you can use for processing your images and visualize the outputs. The website is cloud.Pix4D.com. If you don't already have an account, do sign up. Fill out all the details. You get a 15 day trial with them which is great! You can immediately get going. You can check out all the features of both Pix4D cloud and desktop applications and then opt for a paid subscription later on. Pix4D has 4 products. Pix4DMapper which is for surveying, mining, mapping and forensics. Pix4DBim for construction, earthworks, building information modelling and inspection. So let's look at examples to illustrate. So click on Pix4DMapper and go into the quarry example. This is the interface for Pix4DMapper. This is used for one-time projects. This could be for a survey requirement when your customer has just bought the property and wants to do a topography survey or for an urban town or city which needs mapping to be done to map out its properties and assets. Here is a download option. You can export the project to Pix4D desktop and then work with it there. You can also download the individual outputs like the quality report, the dot obj file, which is the source file of the 3d model, the point cloud, the orthomosaic, the DSM, and the processing log. You can use this interface for distance measurement and area measurement. You can toggle the elevations map and the satellite image as well. With the DSM, you can adjust the opacity from 0 to 1. 0 makes it completely invisible and one makes it fully visible. The same can be done for the orthomosaic. You can adjust the histogram of the DSM and show only a certain range of elevations. So that the Pix4Dmapper. You now let's upload a new data set into Pix4Dmapper. So, click on upload new project. So choose all the files. Click open and it starts uploading. Once the upload is done, click on start processing. The amount of time it takes really depends on the number of images you have uploaded. Safety of Employees: Though land surveyors are paid above the national average, they will work closely with weather conditions or physical fatigue. Land surveyors’ work is always outdoors regardless of weather and consists of a lot of stamina and potentially long commutes. There is also an additional danger such as heavy equipment and hazardous injuries. These several risks associated can be significantly eliminated with land surveying when using drones to map projects, significantly reducing the risk of personal injury. With the push of a button, the use of drones can autonomously survey a site, obtain a complete aerial mapping of the site, land back at its launch location, and upload its model and data to a secure cloud in a matter of minutes. Plus, this entire process does not put anyone at risk of serious injury. Faster Acquisition of Data - Land surveying requires long run hours and carrying heavy equipment from one location to another. Drone technology helps in inspections and surveys. Drone mapping can be accomplished in record time to complete a site survey with same the amount of accuracy data as you would on foot. Drone technology allows each project for ad hoc flights of entire sites or specific areas of projects to gain easy access to the most up-to-date information on a site on regular basis. Improved Data Resolution - For construction projects that may have used manned helicopters or planes to retrieve topographic data, drones can fly closer to the ground surface and supply much-improved data resolution for aerial surveying and photography. When combined with state-of-the-art software solutions for drone surveying, along with cloud-based, high-resolution 3D mapping solutions, problem areas are captured more accurately and virtual collaboration between all project stakeholders is more efficient. Access to Unreachable Locations - The most common utilizing of drones for land surveying is in measuring locations where vehicles and personnel can not otherwise access. Surveying on agricultural, forested, and environmentally sensitive areas or flooded areas and congested city landscapes are perfect assignments for drone technology. The UAVs technology offers a cost-effective alternative to surveying inaccessible sites, in a matter of hours compared to days or weeks. 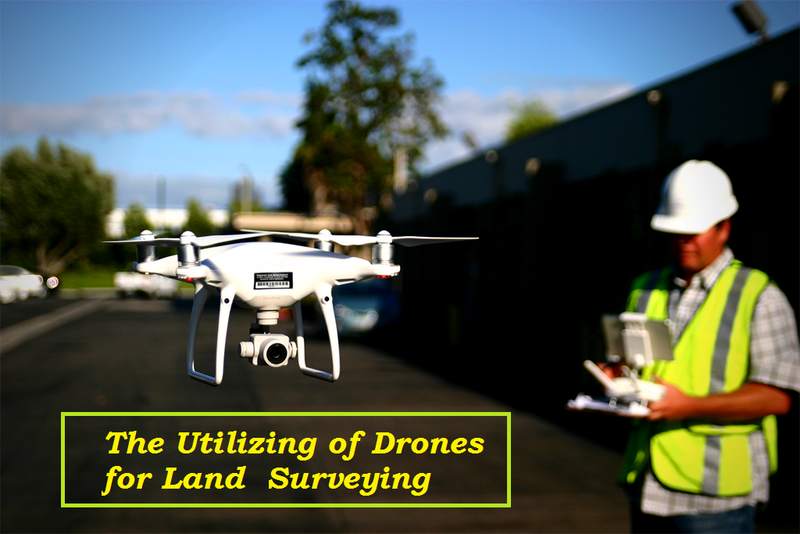 0 Response to "The Utilizing Drones for Land Surveying"